Watch gulls drift along Aquinnah's rainbow cliffs to meditative Native American flute. Wander by Menemsha fishing shacks as Island legend Alfred VanDerHoop tells you of the perils of swordfishing. Ride a safari truck through Cape Pogue wildlife preserve as you see the ancient cedars, and Habiscus like flowers. The Chappy Ferry and Edgartown Waterfront return you to the Vineyard from Chappiquidick's Cape Pogue. as piano and cello create a tune for the dancing light. but you will be one of the few who see the restoration crew bringing it back to life. and mainlanders respond in times of need. over the 10,000 years that Native Americans have inhabited the Vineyard. 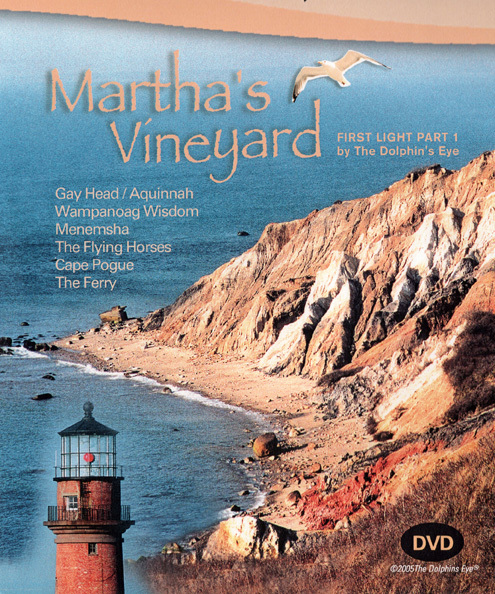 If you come to the Vineyard in search of the road less traveled, this video is for you! bring you the tranquility and beauty of the Vineyard. memorable experience you will want to share with friends and family. The ideal gift for anyone who wants to escape to the Vineyard. First Light Part 1, Martha's Vineyard; and First Light Part 2, Cape Cod and Magical Islands. I loved the choice of musical background. It blends nicely, with a moving effect in an appropriate and unobtrusive manner. These DVDs would make a great gift. How can I get a copy?